This is a subject that fills me with rage. Not just mere anger, annoyance or irritation. R A G E. It's one of those things that makes me feel homicidal. And that's putting it mildly. To think that 100% of women in India also feel the same way infuriates me even more. This is a problem that is not going to go away. Not while most Indian men are still brought up with the idea that it is 'okay' to feel up every girl or woman that crosses their path. 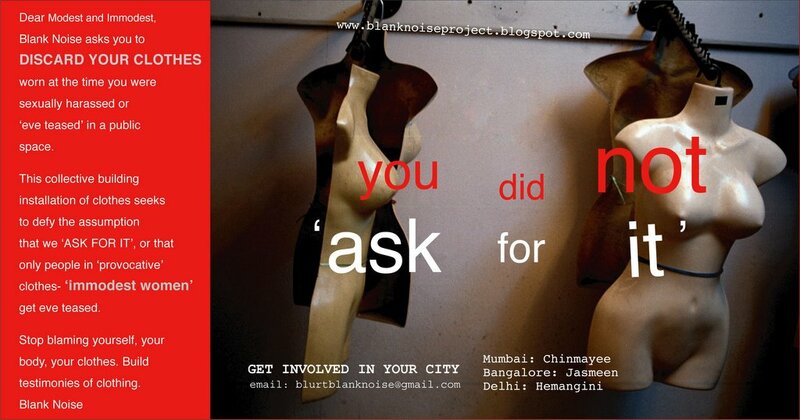 The Blank Noise is fighting to make street harrasment (or eve teasing) unacceptable. That's the word that should define how we women react to being talked to, touched or looked at on the street - UNACCEPTABLE. I grew up having a tough vision of myself as a woman. My gender, as a child, a teenager or in my 20s, was never a disadvantage. My mum taught us to be very, fiercely proud of ourselves. Sadly, the rest of the city did not have such wonderfully feminist mothers. Growing up one had to deal with all sorts of men- those that just 'thought' (and you could see it in their faces) or those that actually 'tried'. Then there were the creeps at railway stations who would push against you and protest that it was an accident if you made a noise (or if they were slapped or hit with my trustworthy brolly, as I was wont to do). Or those fellows in buses who took up more than their fair share of the seat, legs splayed wide. If a polite request to glue their knees together didn't work, I have been known to call the conductor and complain about the harrasment resulting in getting the creep thrown out of the bus. Or what about those men who sit on the seat behind you in a BEST bus and then proceed to touch you from the gap between the seat and the bus wall. Some of them have since wished they were born without fingers, but the city (and country) is still teeming with them, with more coming out of the woodwork every minute. I won't even bother to talk about those who expose themselves at bus stops or those that pinch you as you walk by in a crowd. There are just too many. For all these and more, I have always responded. In retrospect, sometimes not very wisely. Retaliation, however, was an instinct. Keeping quiet or 'accepting' it was not part of the deal. My penchant for anger at such incidents was so great that I know my mum often feared for my safety till I got back home. But there was no way I was letting anybody get away with this. No way. As far as I was concerned, nobody has a right to touch me without my permission. Nobody. If they did, it was asking for trouble. Being in England has been so vastly liberating for me. I cannot even begin to express what a relief it is to be able to walk down a crowded road and have men maintain a safe distance from you. It's not about me being Indian or not attractive enough. As women of all ages, shapes,size or color will testify, none of those things matter. And your clothes certainly do not contribute to your harrasment. Being completely covered is not a pre-requisite to being safe. Here, I not only walk without having to twist my body away each time I see a man bearing down upon me like a freight train, but gratefully, I can run. I can run on pavements and public streets and not be heckled. I can run or take a brisk walk and not be propositioned. I feel no fear when I run in the dark. You can be mugged of course, but that's a different kind of crime we are talking about. Here, I can wear almost anything I want and feel comfortable enough to go out - knowing that I won't hear lewd comments or have a hand up my top. In the past year or so that I've been here, I have not had one experience that has made me feel uncomfortable about being a woman. Not one. And that's something to say for this country which has many negative points as far as accomodating people from other countries goes. For that reason alone, I will be sorry to leave England. Shoefie sums it up eloquently saying, "Worse things have happened to others. But what binds us is our silence." Join in the debate. The least we can do is make a noise. Older PostWhy Did You Touch Her?